Silicon Valley arbitration was the focus of this summer’s Season Two finale of the HBO hit television series Silicon Valley. 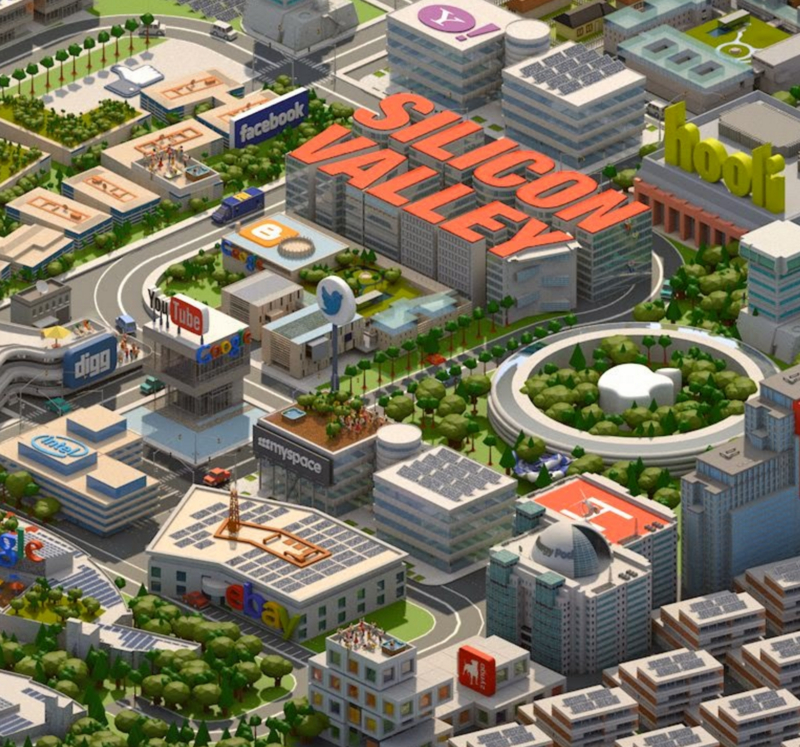 The show provides an amusing caricature of life and work in Silicon Valley. Often the portrayal is not far from reality. The show’s season finale focuses on what we’re about at Silicon Valley Arbitration & Mediation Center. It accurately captures Silicon Valley’s growing reliance on arbitration to quickly and efficiently resolve tech disputes. In this post, we separate some of the fiction from the reality. Read on, with the warning that spoilers are ahead. Silicon Valley follows a tech startup called Pied Piper and its team as they work to develop a ground-breaking data compression product, secure angel and venture capital financing, grow the company and confront challenges imposed by a well-established and heartless corporate competitor called Hooli. The show’s main character, Richard Hendricks, Pied Piper’s CEO, was employed by Hooli while he did early coding on Pied Piper’s compression technology. Richard unwittingly provided an early version of the code to Hooli engineers who reverse engineered it to develop a competing Hooli product. To add insult to injury, Hooli sued Pied Piper for copyright infringement claiming the code belongs to Hooli. In the episode Binding Arbitration, Pied Piper and Hooli agree to binding arbitration so that the dispute can be decided quickly and privately instead of publicly in court. To further keep its costs down, Pied Piper relies on a disbarred attorney, who is comically open about his criminal misdeeds and search for redemption, to represent it in the arbitration. Hooli relies on a well-honed team of big firm Silicon Valley lawyers. The parties turn to an impressionable but capable retired judge to serve as the Arbitrator. The plot turns on Richard’s admission that he used a Hooli computer to test part of the code when his own notebook, which he affectionately referred to in emails as his “girlfriend,” was in the shop for repairs. The admission means that, by law, the code is owned by Hooli. In the season finale (Two Days of the Condor), however, the Arbitrator makes a surprise ruling that Richard’s employment contract is void because it also contains an illegal provision prohibiting post-employment solicitation of Hooli employees and, therefore, he decides in favor of Pied Piper. So how did Silicon Valley get it right – and wrong – about Silicon Valley tech company arbitration? One: It’s true, disputes like this happen all the time in the tech industry. The reality is this story line occurs every day in Silicon Valley. In some cases, startups are founded by entrepreneurs who develop code that is owned by their former employers. Sometimes they knowingly steal the code and other times they do so with innocent intentions. In other cases, established companies bring copyright or trade secret infringement claims against former employees when the code is rightfully owned by the former employees. Sometimes the companies have a sound basis to believe the code was misappropriated and other times the claims are made solely to slow down or drive a new startup out of business. In all cases, the dispute can be costly and time-consuming, with litigation often taking years to resolve and damaging both sides in the process. Two: It’s true, arbitration is the trend in Silicon Valley because it saves time and cost and provides privacy. Arbitration is ideally suited for technology company disputes. The average business litigation in the US takes over three years from start to finish, and often longer if there are appeals. The same dispute can be typically be fully resolved by arbitration in a period of six to nine months, or considerably less time if the parties want to expedite the process. A properly managed arbitration will cost less than half the cost of litigation, and can cost substantially less if the parties work to limit costs further. Plus, arbitration provides privacy and isn’t burdened by the uncertainty imposed through jury decisions and lengthy appeals. Three: It’s true, arbitration is informal but it’s still a legal proceeding subject to laws and rules. California has some of the most well developed arbitration statutes and ethics laws in the country. A good lawyer will insist that arbitrations be administered under rules developed by leading ADR providers. These laws and rules are designed to provide integrity to the process and protect the parties. Although Pied Piper’s disbarred attorney was amusing and did an admirable job in preparing for the case, a disbarred attorney cannot represent a party in arbitration in California. And a good California lawyer wouldn’t have to depend on the Arbitrator to come up with the winning argument in the case. Four: It’s true, arbitrations must always be decided based on strict application of the law. Some people have the misperception that Arbitrators don’t need to follow the law. To the contrary, unless the parties agree otherwise, arbitrators are required to decide cases based on the law. In fact, although there are limited grounds to review an arbitration award in court, an arbitration award can be invalidated for manifest disregard of the law. Likewise it is a misperception that Arbitrators tend to “split the baby” in making decisions. The show got it right: good Arbitrators decide based on the law and are quite willing to rule for the prevailing party. Five: It’s true, sometimes retired judges are asked to serve as arbitrators but most technology sector Arbitrators have sector experience and are trained in technology law. Retired judges are often called upon to adjudicate routine disputes but most technology cases benefit from industry expertise, be it in the way technology is developed, the way technology companies are funded or the way technology companies do. The majority of the appointees to the SVAMC Tech List, for example, are technology sector lawyers by training, not retired judges. Technology and international business law expertise is especially preferred over US courtroom practice in international cases. And in larger cases, often three arbitrators are used to ensure the decision is right. Six: It’s true, arbitrations allow for very efficient decision making but it’s unlikely to get a decision on the day of the hearing. One of the most significant benefits of arbitration is that cases can be decided quickly. The time period for discovery can be limited and the process is expedited without appeals. As in the show, arbitrations can resolve disputes in short order. In fact, many of the leading arbitral providers now offer rules allowing for expedited and emergency decisions. But, unless the parties agree to an expedited process, it’s unlikely they will get a decision on the day of the hearing. Typically, arbitrators in complex business cases will provide written decisions thirty days after the hearing is completed. Seven: It’s true, in most jurisdictions, including California, employers have rights to inventions created by their employees; however, those rights are limited. In general, employers’ rights are limited to inventions created in the course of the employee’s work for the employer and to inventions that relate to the business of the employer. To be safe, most technology companies include provisions in employment contracts or separate invention assignment agreements that define and expand ownership rights. The suggestion in the show was right: where code is developed at work by a programmer using an employer’s tools, there is a significant risk of a finding that the employer has ownership or use rights. Eight: It’s true, most non-competition and non-solicitation provisions are illegal in California. In order to promote innovation, California provides unique protections for employees who leave their employment and compete with their former employers. As elsewhere, California protects trade secrets but, with certain exceptions, California prohibits non-competition and non-solicitation provisions that otherwise restrict an employee from working for a competitor or soliciting former co-workers. In California, employment contracts containing illegal non-compete provisions are void as a matter of law. To discourage the use of such provisions, California law does not allow such illegal provisions to be severed from the rest of the employment contract. Accordingly, the show got it right: all Hooli employment contracts containing illegal non-solicitation clauses would be void under California law. Nine: Well, wait, Richard was still an employee. Although there is some merit to the show’s legal analysis and it makes for a good ending, it falls short in the end. Despite getting items Seven and Eight right, the legal analysis in the show is off because voiding the employment contract would not void the employment relationship. Richard was an employee, even if his employment contract was invalid. So, maybe Pied Piper would still win but it wouldn’t be so easy. It would depend on some unknowns: what Richard was specifically hired to do, what he actually did in developing the code and how closely the code was related to Hooli’s existing business. We all want to root for the good guy; it’s just a little complicated to get there. Ten: Overall, Silicon Valley did a great job. The show’s writers did a great job in conveying the way legal disputes in Silicon Valley are being resolved. Most disputes are negotiated directly by the parties, otherwise settled with the assistance of a mediator or, increasingly, arbitrated rather than litigated in court. It rarely makes sense to have technology company disputes decided by a judge or jury; it takes too much time, costs too money and provides results that are uncertain and sometimes wrong. As the writers in Silicon Valley showed, tech companies, large and small, want dispute resolution that syncs with the way they do business: decision making that is quick, efficient and effective. Long drawn-out court trials may make for good television drama elsewhere but, in this case, Silicon Valley got Silicon Valley right.